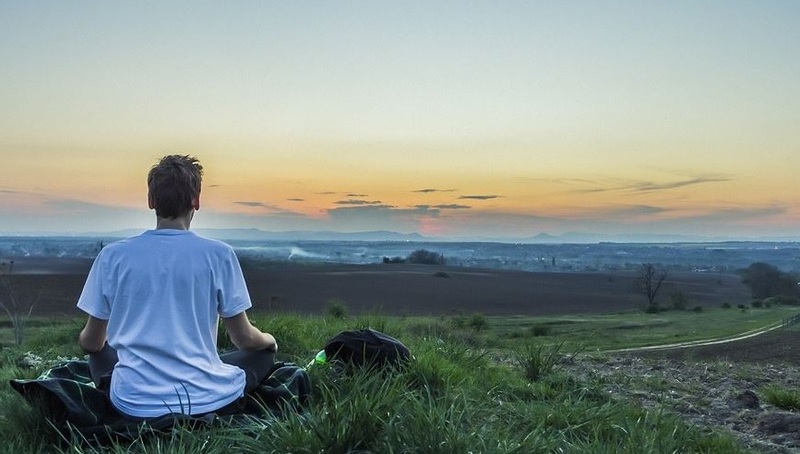 Both meditation and mindfulness have become popular movements due to the proven benefits of using these practices to improve mood, distress, anxiety, anger, and depression. There has also been research done in cognitive neuroscience that links meditation to changes in the brain structure in ways that help one overcome fear. As people learn proper meditation, it may be common to experience an increase in fear, but alternatively, the actual feeling of fear becomes increasingly less disturbing. Meditation is an exercise that brings acute attention to one single focus, when in turn strengthens awareness. Meditation teaches you how to focus all of your attention on one aspect of your current surroundings. For example, the meditation practice known as mindfulness teaches you to focus only on the sensation of the breath. Various meditation practices may suggest the focus to be on the body's sensation of movement, an image, a prayer, or a sound. While are minds are trained to be busy and multi-task, meditation increases the strength of attention, changing this natural progression of thought. You learn to choose where to place your attention. Attention can be directed away from fear. During a full meditative state, you focus on whatever you choose and connect with your inner stillness. This deeply peaceful state leaves no room for fear. When not in a meditative state, moments of fear can return. Even if you were able to meditate all day, your mind would still find something to fear. However, the time of peace between fears helps us to overcome our fears due to meditation. For many people who master meditation, the realization that fear is not permanent, and the ability to get to a peaceful state is always available, helps people ease their fleeting fears. For example, people who have experienced trauma in their lives often become fearful when faced with similar situations. If you are in a car accident, you may become fearful of driving. A specialist from Scherline And Associates says auto accidents happen unexpectedly, and with surprising frequency. As a result, many people deal with the fears caused by a past auto accident on a daily basis. For these people, a daily commute could be a stressful endeavor. Meditation can be used to combat this fear—addressing the trauma of the accident and recognizing that it has no power over one’s peace of mind is the first step in overcoming the fear. According to some, concentrated awareness is a deep and lucid phenomenon. It occurs in everyday moments when we look around ourselves, or stop doing what we are doing for a minute and taking in our current surroundings. Rather than just looking around, we are seeing our surroundings in a deeper and more complex way, bringing peace to the mind. This can help put any fears into perspective. Meditation clarifies the art of concentrated awareness. While awareness used to be mixed with feelings and thoughts into an uncertain sense of self, it is now a very explicit knowledge. It's a lucid sense of wakefulness. Fear is a constant feeling for everyone. Fear of the unknown or the next step are often the greatest fears we experience. When using meditation to turn inward and focus on yourself and your current surroundings, you are able to realize that overcoming fear is not what is important, for it will never go away. Part of what makes life so incredible are the feelings that we experience. Rather than learning to overcome fear, meditation will teach you to accept fear and how to properly handle those situations. In this exploring of our immediacy, we learn that opening unconditionally to all of our life's experiences—whether that be trauma, joy, inspiration or disappointment—no matter the circumstances, we must instinctively be brave. We must express our confidence that we can fully touch our own lives, regardless of the circumstances. Meditation encompasses this bravery—learning to open to our life's experiences without fear.